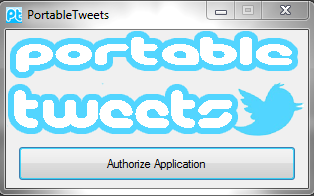 PortableTweets - New Portable Twitter Application! 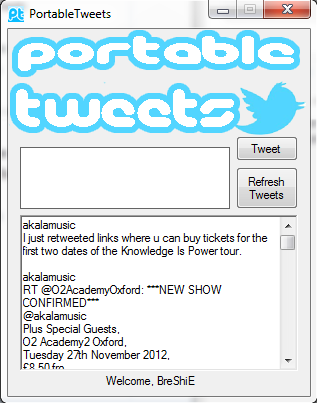 .Net Showcase PortableTweets - New Portable Twitter Application! [VB.Net] PortableTweets - New Portable Twitter Application! Here's my newest program! I've just been messing around with the twitter API today after finally FINALLY getting it to work, lol. I'm actually going to use this program myself for when I don't want to go online, haha. The main reason I created this was for an easy way to tweet, and read tweets into one simple application! It's pretty basic, I've got a lot of details to attend to, but I'm releasing it as-is because it's working fine, I've just got a lot of error handling to do. I've been a bit cheeky and made it follow myself, so for those who actually bother to read this can just go ahead and unfollow me if you wish. This post was last modified: 09-12-2012, 03:03 PM by BreShiE. RE: PortableTweets - New Portable Twitter Application! Why don't you embedded the TwitterVB.dll in your exe file ?? Who should we credits for the use of this TwitterVB.dll library (without whom the project wouldn't have been possible) ? 2) The project is discontinued, and no longer supported, so I'm not sure who either. Thx to him. You can credits him now. This post was last modified: 09-12-2012, 02:57 PM by sh@rp. Thanks. :) I'll embed the .DLL is the next update and update the OP crediting him. I'm going to continue to mess around with the API, see what else I come up with, but I need to focus on VB6 due to my college work. Why not use webRequests instead? .idb posted an example of how to do this on that one site. An API limits certain things generally. Plus it is good practice. It only limits things if you want extensibility, otherwise I'd also have to agree with "Why not?". You develop for the scope of your application. But because Twitter created this API for these purposes, it's probably a good thing to use it.